We had decided to have an early dinner so that we would have more time to spend driving around at night to see if we could find any of the smaller nocturnal animals. Little did we know what the night had in store for us. We left at dusk and headed out to see if we’d be lucky enough to witness the shift change between the day walkers and the night stalkers. The drive started off fairly uneventfully, with the general grazers still milling about trying to get in a final mouthful of food before having to pay closer attention to what was going on around them. Kudu darted across the road in front of us, as if they were trying to get to the shops before closing time. The giraffe just stood around, seemingly unfazed by the changes happening. With only an hour’s driving under the belt, we’d already come across a small spotted genet and a honey badger going about their business, a couple of spotted eagle owls, and a number of bush babies performing death defying leaps between branches. We were also just in time to see the glistening bottom of a hippo as it beat a hasty retreat in order to get away from our spotlight. On our way home we stopped to see if the lions we’d seen earlier in the day had roused themselves from their afternoon siesta yet. As we approached their last known position, we saw eyes shining back at us in the dark. Just as we’d guessed, they still hadn’t moved. As we drew nearer we noticed large objects taking form in the dark. The closer we got, the clearer they became. 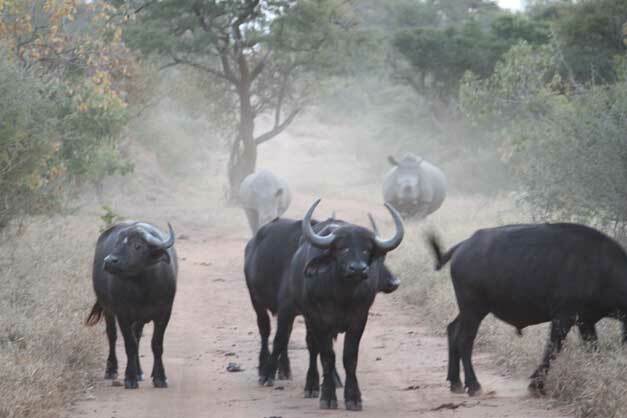 A small herd of “dagga-boys” (old buffalo bulls) had bumped into the four lionesses we’d come to visit. Neither party was particularly enthralled by the other’s presence, but not trusting each other with their backs turned resulted in a stalemate. As we sat watching the stand-off, more shapes appeared from the one side. At first we thought it was more buffalo, but it turned out to be three white rhino passing through. We weren’t sure if this was purely accidental, or if curiosity had gotten the better of them. Unperturbed, they willingly took up position in the now three-way battle. This back and forth between the various gladiators went on for about ten minutes, before the lions decided to change tactics by lying down at varying distances from where the rhino and buffalo stood standing. Not trusting the silence, the buffalo moved to where the lions had just been. We were quietly waiting to see what would transpire next, when out of nowhere a young elephant bull came flying out of the dark. Trumpeting loudly, it threw everyone into a complete state of panic. The buffalo fled straight towards the lions, and they in turn ran off in different directions. The three rhinos were not that easily swayed however, and swung around to face their attacker head-on. This caught the elephant off-guard, causing it to come to a halt about 5m away from them. He ranted and raved for a while, and then redirected his frustrations at the buffalo and lions. They were all too quick and agile for him though, deftly stepping out of his reach and then turning to see where he would head next. His main focus became the three rhinos. Time and again he charged them, stopping mere feet from where they stood. The lions moved off about 50m or so, having had their time in the limelight they opted to become spectators instead. The buffalo also left the scene, continuing to graze as they disappeared into darkness. But the recalcitrant elephant was determined to chase off the rhino. The rhino were having none of it however, and steadfastly stood their ground. The elephant continued to rumble, trumpet, kick up dust, and run this way and that. At one point he stopped just a few feet from the rhino. Towering over them, he swayed menacingly back and forth. After about fifteen minutes the elephant finally came to a halt. He stood a short way away from the rhino, rumbling and shaking his massive head from side to side. We were so close that we could hear his ears slapping against his shoulders. Whether he’d calmed down or was just taking a breather between tantrums, we didn’t wait to find out. And as we made our way out of the area we could hear the elephant resuming his assault. Wish we had been there!